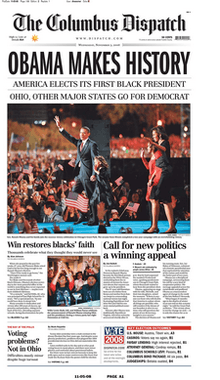 The Columbus Dispatch is a daily newspaper based in Columbus, Ohio. Its first issue was published on July 1, 1871, and has been the only mainstream daily newspaper in the city since The Columbus Citizen-Journal ceased publication in 1985. In a sale announced on June 3, 2015, ownership of the Dispatch was transferred to New Media Investment Group. The Dispatch Broadcast Group, comprising WBNS-AM-FM-TV in Columbus and WTHR in Indianapolis, will remain in the hands of the Wolfe family. As of October 26, 2015, Bradley M. Harmon is the newspaper's president and publisher. Alan D. Miller is the editor. The paper was founded in June 1871 by a group of 10 printers with US$ 900 in financial capital. The paper published its first issue as The Daily Dispatch on July 1, 1871, as a four page paper which cost US$0.04 per copy. The paper was originally an afternoon paper for the city of Columbus, Ohio, which at the time had a population of 32,000. For its first few years, the paper rented a headquarters on North High Street and Lynn Alley in Columbus. It began with 800 subscribers. On April 2, 1888, the paper published its first full-page advertisement, for the Columbus Buggy Company. In 1895, the paper moved its headquarters to the northeast corner of Gay and High streets, a larger building on a site which was previously a grocer. On April 10, the paper published a 72-page edition to mark the move. On December 17, 1899, the paper published its first Sunday edition, a 36-page paper which cost US$0.03, and the daily editions were reduced in price to US$0.02. Two years later on March 3, 1901, the paper published its first color comic strips. The paper, renamed The Columbus Evening Dispatch, changed hands several times in its early years. In 1905, it was purchased by the Wolfe family, with brothers Harry Preston Wolfe and Robert Frederick Wolfe. The Wolfes, who originally ran a shoe company, had purchased the Ohio State Journal two years before. On December 16, 1906, the paper published its first color ad, for Beggs Store. On April 9, 1907, the Dispatch offices were destroyed in a fire, and the building was demolished and rebuilt. In the interlude, the paper ran its offices out of 34/36 North High Street. A competing paper, The Columbus Citizen-Journal (known locally as the "C-J", pronounced "See-Jay") was beholden to the Columbus Dispatch for its printing facilities, and controversy surrounded the C-J's demise in 1985. On June 16, 2015, the Dispatch was purchased by the New Media Investment Group. Historic Columbus Dispatch building at 34 South Third Street, across from the Ohio state capitol building. The sections of the Dispatch include the Front Section, Nation & World, Metro & State, Business, Sports and Life & Arts. The Food section is included in the Wednesday paper, while Science is published on Sundays. The Weekender section is included in the Thursday paper. A Faith & Values section is included in the Friday paper. Sunday sections include Travel, Arts, At Home, Insight and comics. ↑ "Total Circ for US Newspapers". Alliance for Audited Media. March 31, 2013. Retrieved August 22, 2013. ↑ (Oct. 16, 2015) "Bradley Harmon named president and publisher of 'Dispatch'," The Columbus Dispatch. Retrieved Nov. 19, 2015. ↑ (Aug. 11, 2015) "‘Dispatch’ promotes Alan D. Miller to Editor." The Columbus Dispatch. Retrieved Nov. 19, 2015. ↑ "Endorsement: Kasich for governor", Columbus Dispatch, Monday October 11, 2010. ↑ Malone, JD (2015-06-16). "New Media completes acquisition of 'Dispatch'". The Columbus Dispatch. Retrieved 2015-07-03.